R.L. Stine’s Goosebumps has been providing the world with spooky, kid friendly thrills since 1992, and while the book series made the jump to t.v. not long after the books were published, it took much longer to make it to the big screen. But here we are, and, with Rob Letterman at the helm, it is a decidedly meta affair, with Jack Black (re-teaming with Letterman after 2010’s Gulliver’s Travels) playing Stine himself, here a recluse who lives in constant fear of his creations. You see, every monster Stine conjured up in his imagination came to life, forever trapped in the original manuscripts, which are kept under constant lock and key. When new kid in town Zach (Dylan Minette) thinks Stine’s daughter Hannah (Odeya Rush) is in danger from her father, he breaks into their house and accidentally unleashes Stine’s creations on the world, with the three of them the only hope of putting them back. 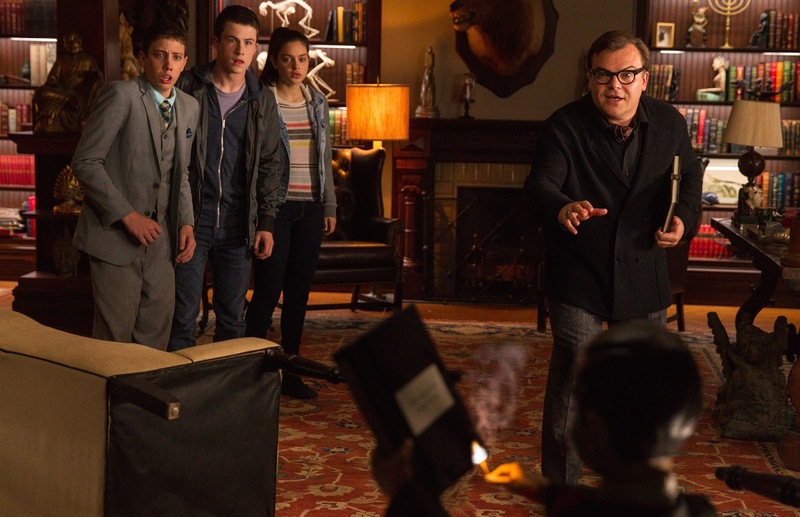 Goosebumps is a movie that thrives on nostalgia. Not just for the original books, but for the harder edged kid movies of decades past, when Joe Dante and Chris Columbus were at the top of their game. The whole movie is a homage to the likes of Gremlins, The Goonies, and even 90’s fare Jumanji and Hocus Pocus (the two movies this could be called a mash-up of), capturing the tone of these classics perfectly while still making it palatable for a younger audience. It’s a movie that is trying to appeal to both kids and adults, and Letterman pulls it off with very little in the way of hitches. The script bubbles with humour which caters to the kiddies first and foremost, but there is quite a number of gems that will have the adults chuckle, especially a running gag about Stine’s animosity towards fellow author, ‘Steve’ King. Black is a bit more restrained here as the effete Stine, and he plays well off his co-stars, game for anything the script throws at him. Rush and Minette are the perfect heroes for this type of story, likeable, brave and headstrong, and like Black, just throw themselves into proceedings. While it might take its time with the set up, once the first monster bursts from his paper prison, we’re sent on an entertaining ride that doesn’t really let up till the credits roll. 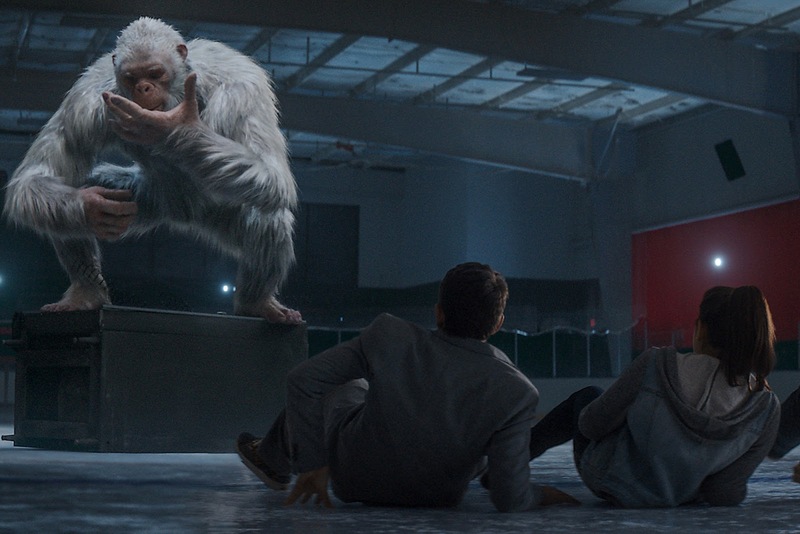 While the narrative is really a series of encounters with the monsters of the books, from malevolent garden gnomes to a giant paying mantis, you will find yourself just caught up in the fun of it all , some dodgy CGI aside. Personally, I feel the computer effects hurt the movie slightly, betraying the movies Letterman is trying to emulate. But that’s a minor niggle, as is Black pulling double duty as lead villain Slappy the ventriloquist dummy (it makes sense since he is Stine’s creation, but it doesn’t make it any less distracting) and you will be so engrossed is what’s dancing in front of your eyes, it won’t matter. A solidly made kids movie, Goosebumps offers something for everyone. For kids, it will put a huge smile on their faces, while the adults in the audience get a loving nostalgia hit that brings them back to their youth.